Richa Chadha Becomes The Only B'Wood Celebrity To Pay This Unique International Tribute! 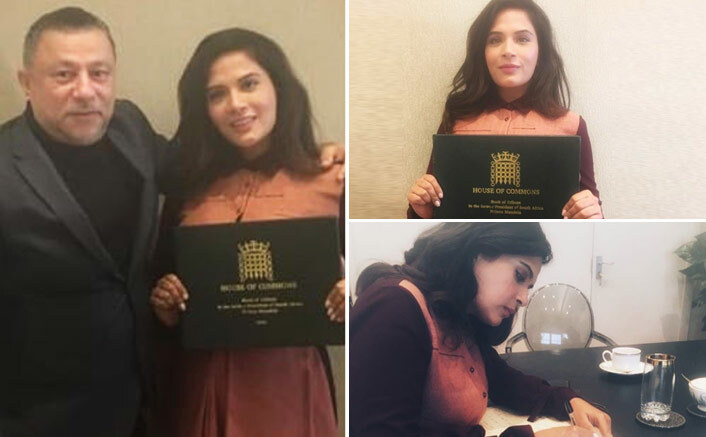 Home » Bollywood News » Richa Chadha Becomes The Only B’Wood Celebrity To Pay This Unique International Tribute! Richa Chadha Becomes The Only B’Wood Celebrity To Pay This Unique International Tribute! She was also invited as a guest on a BAFTA Award winning news show of Victoria Derbyshire. Actress Richa Chadha always has some surprises up to her sleeves. The versatile actresses has explored almost all realms of film-making other than being an actor. She is also vocal about her thoughts and speaks her mind openly on issues close to her heart on various public platforms. Recently she was in UK to promote her recently released film Love Sonia that was released there this past weekend. She was also invited as a guest on a BAFTA Award winning news show of Victoria Derbyshire. Now with the latest development Richa added one more feather to her hat by being the only Bollywood actor to have her hand written message featured in a unique booked called the, The House of Commons Book of Tribute to the late Nelson Mandela, former president of South Africa and a world leader. It’s a book that has hand written messages by prominent people across the world. The book has more than 700 handwritten messages from some of the most prominent people in the world, including President Barack Obama, Kofi Annan, British Prime Ministers and hundreds of leading International Business and Community Leaders as well as sports, music and film stars. David Beckham, Sir Paul McCartney, Sir Richard Branson, Maya Angelou, Russell Crowe, Chris Rock, Kylie Minogue, Will Smith are amongst the host of stars who have written meaningful messages in the book. The book will soon be published and will be made available globally. The proceeds from sales in each country will go towards fighting Child Poverty in that country. The book is a major tool to help continue Mr Nelson Mandela’s mission to end child poverty and racial intolerance. Jab 16-Year-Old Mira Rajput Met Shahid Kapoor For The First Time!